Home » Posts Tagged "SB 423"
The Senate this afternoon took up Sub for SB 61 the school finance fix bill that restores the missing $80 million that had been intended in SB 423. The House drafted the bill in a special Appropriations Committee meeting on Friday night the debated it, advanced it, and passed it on final action on Saturday. The Senate took up the matter after 2:00 today and with relatively little discussion or debate, passed the bill on emergency final action on a vote of 31 to 8 with one Senator passing. Click here to see how your Senator voted. The bill now goes to the Governor and he has indicated that he will happily sign it, moving the decision on school finance adequacy to the Supreme Court. This action means what was intended in SB 423 is not actually what has been passed. Also today the Senate adopted their budget in Sub for Sub HB 2359 on a vote of 28 to 12. This action puts two competing budgets into conference and the conference committee met this afternoon and evening to begin negotiations. This is an arduous process since the budgets are enormous and 14 pages of conflicting positions are being discussed. There will be a lot of back and forth offers until a comprehensive package of some House positions, some Senate positions, and some compromise positions are put into a conference committee report for consideration by both chambers. At the same time, the tax conference committee is working out compromise positions on a number of bills. The big issue there will be what to do about Sub for HB 2228, the Senate’s massive tax cut package that, if passed, puts the whole budget being worked out by a different committee in jeopardy. Negotiations on the Budget continue tomorrow at 10:00 am; tax negotiators meet again tomorrow beginning at 10:30. It will likely be a very long day! The House this morning passed HB 2365 on a final action vote of 92 to 24. Debate on the budget lasted into the night yesterday with many amendments offered and most defeated. The debate on removing the trip-wire was vigorous and in the end, the Becker amendment was adopted on a vote of 71 to 53. KNEA supported the Becker amendment. Motion by Rep. Whipple (D-Wichita) to prohibit non-disclosure agreements signed by state employees to silence those employees in cases of sexual harassment and/or abuse. Adopted 100 to 12. Motion by Rep. Jennings (R-Lakin) to prohibit taxpayer funds from being spent on defense or fines for any state-wide elected official found in contempt of court (can you say Kris Kobach?). Adopted 103 to 16. Motion by Rep. Holscher (D-Olathe) to prohibit taxpayer funds from being used for penalties or settlements of sexual harassment claims and prohibit making such claims secret except at the request of the victim. Adopted on a voice vote. Motion by Rep. Clayton (R-Overland Park) on legislative transparency would have required names on bills. Objections and challenges came from Rep. Schwab (R-Olathe) first on germaneness (it was ruled germane) and then as not allowed under the rules. The Rules Committee determined that the amendment was out of order because changes to rules have to be done through resolutions. Motion by Rep. Parker (D-Overland Park) to expand Medicaid. It was challenged on germaneness but found to be germane. Failed 56 to 66. Motion by Rep. Whitmer (R-Wichita) to strip $45 million out of K-12 funding (the money he says KSDE spent illegally) and transfer it to higher ed. The amendment would also freeze tuition. The motion failed. A motion by Rep. Garber (R-Sabetha) to stop state money from going to any city or county in Kansas that adopts a resolution or law contrary to federal law (can you say “sanctuary cities?”). Under questioning, it became clear Garber had no real understanding of the extent of his amendment. For example, if a city adopted a gun resolution that was more liberal on gun ownership than federal law, the state could not provide any funding. Failed 28 to 69. The bill was advanced on a voice vote with the final action vote this morning. Last night, once the budget was done and the House went home, the Appropriations Committee met and moved the contents of HB 2796 into SB 61, creating Sub for SB 61 – the school finance $80 million fix. What it does is provide a mandate that every district levy a 15% LOB (they all do now) and direct that the money raised be counted towards adequacy by the Court. It also removes the language that took $80 million out of what was believed to have been in SB 423. Sub for SB 61 is a simple fix of the problem discovered on April 9. The bill was brought to the floor for debate this morning. The first amendment was offered by Rep. Jerry Stogsdill (D-Prairie Village) and it was a big one. It would have stripped out the mandatory LOB language, added the “Trimmer amendment” that increases BASE aid, added the “Pittman amendment” that brings special education funding up to the statutory 92% reimbursement, ends the cap on bond and interest and adds funding for parents as teachers and the ABC therapy program (two programs wanted by the Senate). The amendment was challenged on germaneness because Sub for SB 61 is a simple policy fix and the amendment is an appropriation. After a long delay, the challenge was withdrawn and the debate on the Stogsdill amendment went on. In the end, the Stogsdill amendment was defeated by a vote of 42 to 78. The next amendment came from Rep. Sydney Carlin (D-Manhattan). This one would just repeal the cap on bond and interest; it was one part of the prior amendment. The amendment failed on a vote of 53 to 66. Rep. Jeff Pittman (D-Leavenworth) offered an amendment to increase special education aid from 84% as in SB 423 to 85% – an additional $6 million. This amendment failed on a vote of 49 to 68. Rep. Jarrod Ousley (D-Merriam) offered an amendment to allow other districts to enter the mental health pilot program and expand cooperative opportunities. The original Landwehr amendment specified which districts could participate. Ousley’s amendment carefully kept the Landwehr amendment intact but would merely allow the State Board to choose other districts that could participate. Landwehr opposed the Ousley amendment. The amendment failed on a vote of 43 to 77. Rep. Kristey Williams (R-Augusta) offered an amendment to mandate a 2.5% pay raise for all teachers. It was ruled not germane because you can’t put an appropriation proviso in a policy bill. Rep. Melissa Rooker (R-Fairway) offered an amendment stripping out the requirement that a certain percentage of LOB dollars must be directed to the at-risk and bilingual programs based on the percentage of students in those programs. Districts should be able to decide how best to expend the dollars they get to serve their students. Rooker believes the requirement is a likely violation of equity. Williams opposed the Rooker amendment because 248 school districts have LOB authority they are not using including her own district. They have taxing authority they are not using – they should look at their own effort and if they need money, they should go to 33%. The Rooker amendment, the last amendment of the day, failed on a vote of 54 to 64. In the end, not one amendment was adopted and Chairman Fred Patton (R-Topeka) who argued for a “clean fix” bill with no amendments got exactly what he wanted. The bill was advanced on a voice vote. Later, on emergency final action, the bill was passed on a vote of 92 to 27. Day one of the 2018 legislative wrap-up session was a quiet one. A number of conference committee reports were adopted and some new bills were introduced. The House was done shortly after noon today and the Senate later in the afternoon. Neither chamber planned to work into the night as this is the day of annual Legislative Shrimp Peel, an event to raise money for Kansas Special Olympics. HB 2796 – This would repeal the mandatory LOB provision that caused the error, restore other LOB provisions that had been changed, and adjust BASE aid accordingly. HB 2797 – This would somehow amend the mandatory LOB provision so that the lost $80 million would be restored but we believe would keep the mandatory 15% LOB levy. HB 2798 – This would strike provisions requiring school districts to adopt a minimum local option budget and transfer funds from the supplemental general fund to certain categorical funds; restore certain provisions relating to local option budgets and adjust the BASE aid accordingly. There was another bill read in – probably HB 2799 – that would do what HB 2798 does and increase BASE aid by adjusting how the cost of living index was applied. It would also increase special education aid to the statutory 92% reimbursement and repeal a cap on bond and interest payments. There is also a bill in the Senate (we do not have a number yet) that we understand is the same as HB 2796. We will be keeping an eye on these bills as the session continues. Yesterday we reported on a Governor’s Budget Amendment (GBA) that would prepay $82 million in money owed to KPERS. KNEA supported the GBA. The House Appropriations Committee not only supported it, they augmented it by increasing the payment to $192 million before passing their budget bill out of committee. In response to good revenue projections, the budget committees now have the ability to not just afford the school finance costs in SB 423 but to do good work in other areas as well. These revenue projections are why there is a move to increase the funding in the school finance plan which would, in turn, raise the chances of the plan being constitutionally adequate thus keeping our schools open and ending the need for a special session. But after adding the increased spending to the budget bill, the committee adopted an amendment by Rep. Brenda Landwehr (R-Wichita) that would lapse all the new spending if the Supreme Court did not accept the school finance plan. House Minority Leader Jim Ward (D-Wichita) said the Landwehr amendment was cruel in that it “dangles money” in front of constituents only to pull it back based on the Court ruling. The Landwehr amendment was adopted after an 11 to 11 tie vote with Committee Chair Troy Waymaster (R-Bunker Hill) breaking the tie with his YES vote. In other words, don’t count on the KPERS restoration just yet. The House will debate the budget bill tomorrow. The House did take action today on Sub for HB 2228, the Brownbackian tax cut bill passed by the Senate on April 7. Because the Senate put the plan in a House bill, the House could not amend it, only vote to concur or non-concur in the changes. Tax Committee Chairman Steven Johnson (R-Assaria) made a motion to non-concur in the Senate changes and send the bill to a conference committee. That motion was passed on a voice vote. What this action means is the chances of the House adopting the Senate tax cuts is remote but what tax cut bill might emerge from conference is anyone’s guess. 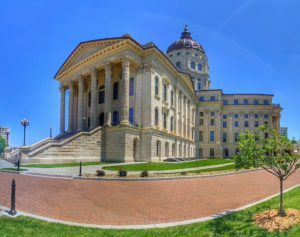 KNEA continues to believe that Kansas would be best served if legislators would resist the urge to cut taxes while we are only 10 months into recovery from the disastrous Brownback tax experiment. Maybe not everyone’s, but it’s on the top of our list! We’re working on rumors and some good intelligence gathering to try and figure out how things will go down come Thursday. First, we know there is a planned fix for the error which is tied to Rep. Clay Aurand’s (R-Belleville) effort to mandate a certain level of LOB effort and label it as part of BASE aid. The error can be fixed simply by repealing that provision and we are hopeful that will be the first order of business. Of course, in the meantime, the state has received more good news about revenue collections and that has spurred a lot of talk about what to do with this “extra” money. Rumor has it that the some in the House will again try to add to the school finance bill perhaps by pursuing either an amendment offered earlier by Ed Trimmer (D-Winfield) to change how the CPI was calculated in determining a funding level or one by Jeff Pittman (D-Leavenworth) that would boost the reimbursement of special education funding to the statutory 92%. Both amendments were considered in floor debate on SB 423 earlier and were not adopted, having received only 41 and 43 votes respectively. If SB 423 is amended to fix the LOB issue and restore the $80 million, we believe there is a chance that the Court will still believe the bill falls short of constitutional adequacy either for the overall increase or for the five-year phase in. Such a Court decision could result in a special legislative session this summer. There is also a chance the Court could call this bill a “good faith effort” and give the Legislature another year to augment the future-years in the plan. We’ll just have to wait and see. If either the Trimmer or Pittman amendments were to be added, it increases the chances that the Court will approve the plan but it may also create a greater challenge getting the bill through the Senate – we are confident Senate President Wagle (R-Wichita) and Majority Leader Denning (R-Overland Park) will oppose such increases. We just can’t predict what might happen to the 21 votes in the Senate if the bill gets costlier. 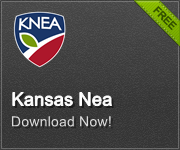 KNEA supports the Trimmer and Pittman amendments because both align with our Legislative Agenda and priorities. But we also believe that, should they be offered and fail, that is not a reason to vote NO on the $80 million fix. 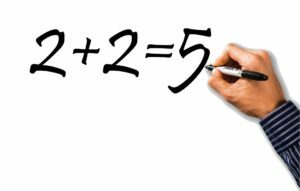 To allow SB 423 with the error to stand as the proposed solution to Gannon would be irresponsible, to say the least. And it would guarantee a negative reception in the Court, a special summer Legislative Session, and the possibility that our schools will be closed come August. Now throw into this the Senate’s massive, “Brownbackian” tax cut bill, HB 2228. This bill, which now goes to the House, gives away more than $500 million in new tax cuts and tax adjustments. Coincidentally, the new school finance bill with the fix costs more than $500 million. Passage of HB 2228 cancels out the revenue needed for SB 423! 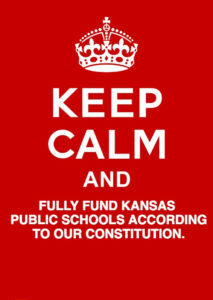 The Court has been very clear that they want a school finance plan that has the money in it. They have essentially said, “show us the money.” To pass a $500 million finance plan concurrent with a $500 million tax cut would be a disaster. Remember that in the early stages of Gannon, the State argued that there was no revenue for increased school funding and the Court responded that the money was there but the Legislature gave it away in the 2012 Brownback tax cuts. Deja Vu all over again! Our hopes for the next nine days? Fix the mistake. Repeal the Aurand LOB amendment. That will restore the bill to the level of funding that was intended on April 7 and take care of new equity challenges. If the votes are there to increase the funding, do so. We support full funding of special education – we always have and always will. If such amendments are not adopted, pass the underlying bill that fixes the error. Do not use a desire to do more as an excuse to not fix the underlying problem. Resist the temptation to cut taxes again. Kansas is still in recovery from the Brownback disaster. Things are looking good but this is not the time to cut taxes. We still have to meet school funding adequacy and we also need to address the mess in our foster care system, the challenges faced in public safety, the restoration of funds taken from the highway program and KPERS, and many other vital services. Tax cuts can wait. Remember that voters in 2016 sent many new legislators to Topeka specifically to restore our revenue system. It’s only been 10 months since that happened. The revenue news means different things to different legislators. Some, as we noted earlier, want to go back to handing out tax cuts as if we had already satisfied the Court school finance ruling, restored the highway plan, paid KPERS back, found the 70 missing children in DCF, and so much more. In truth, the news means that while we can have some necessary things, we still have a lot to do to get back to our beautiful Kansas. For the first time in a long time, the legislature is looking at budget profiles with ending balances above zero. In fact today the budget committees are looking at reports that show the state meeting the required 7.5% ending balance. HB 2228, the tax cut bill would wipe that out of course but in the meantime, they can look at other things to fix. Governor Colyer has submitted a Governor’s Budget Amendment (GBA) that would take funds above the 7.5% ending balance and make an early payment to KPERS. The Legislature is supposed to be making back payments to KPERS by 2020 and this GBA would bring a portion of that payment up now. KNEA supports this GBA. It is critical that KPERS be paid back and the sooner, the better. This one opportunity and action should be enough to convince responsible lawmakers to step back from the temptation to return immediately to the tax policy decisions that led Kansas to the brink of disaster. We don’t need another radical tax cut – that’s how the Legislature created the problems we are facing today. Now that things are turning around, we hope the Legislature will focus on restoration of services and programs that have made Kansas a great place to live, work, and raise a family. KNEA is working with other organizations to make sure that our state has ample time to recover from the Brownback experiment before considering any reductions in taxes. As they return to Topeka, it’s important for them to hear that voters want them to act responsibly to ensure our economic and budget recovery. Please take the time to email your Legislators. Click here to send a message to your Legislators. There’s been lots of talk about the school finance bill (SB 423) error and what to do about it. Governor Colyer signed SB 423 into law and at the same time urged the Legislature to waste no time in fixing the error so that the bill matches what everyone thought they were voting on back on April 7. The $80 million error is the result of an amendment by Rep. Clay Aurand (R-Belleville). Aurand has been pushing amendments to require a certain level of LOB authority in an effort to “get credit” for the state for more funding than the state was actually providing. Essentially, he wants the Court to believe that, since LOB levies are not being used for enrichment as per the original intent, those levies should be credited as state aid. Of course, the reason the LOB is not being used for enrichment is because the state has not even kept pace with inflation in what is provided to schools. To get this “credit,” Aurand has proposed amendments to mandate a certain level of LOB authority. He has tried various levels from 30% down and when he finally put the level at 15%, he got what he wanted. SB 423 contains a provision mandating that every school district levy a 15% LOB. Aurand has been pressing this issue since Montoy and his fellow legislators finally agreed when he put the mandate at a level that all school districts were now meeting anyway. But what his amendment did was make that 15% levy part of the “new funding” in SB 423, lowering the actual amount of new money by $80 million. Without that new money, the Court is highly unlikely to approve SB 423 – as it is, they may not approve it. When the Legislature returns on April 26, the first order of business ought to be fixing SB 423. One way to do that is to strip out the Aurand amendment. We know that some will be trying to do that. We have also heard that with the bill opened up again, some legislators may try to do all kinds of mischief. Remember that the bill passed with the smallest possible majorities. While most legislators speaking on the issue have expressed a desire to simply fix the error and move on, there are others who have openly called this an opportunity to change the funding entirely. Tell your legislators to fix SB 423 so that it matches what was intended on April 7. Then there is Sub for HB 2228, a disaster of “Brownbackian” proportions. One would think after the disastrous Brownback tax experiment of 2012 and the struggle to reverse it in 2017, legislators would have little appetite to once again damage the state’s revenue stream. But one would think that only if one had never met the Kansas Senate. The bill is expected to cost the state treasury a half-billion dollars over the next five years and, coincidentally, the new school finance bill will provide a half-billion dollars to schools over the next five years! It was almost as if the Senate was looking for a way to justify voting NO on SB 423! Less than one year after the Kansas Legislature ended the disastrous Brownback tax experiment, why would they pass a new tax plan riddled with uncertainties? Fortunately, it is not passed yet! The House will have a chance to end this new disaster when they return on April 26. They will not be able to amend HB 2228, only to vote to concur or non-concur in the Senate changes to this House bill. The best thing the House could do is to kill Sub for HB 2228. There is no good reason to jeopardize the state’s recovery from the Brownback experiment. Instead of unaffordable tax cuts, Kansas needs to invest in education, healthcare, infrastructure, and communities. Tell your Representative to reject Sub for HB 2228. Secretary of State Kris Kobach, as a candidate in the Republican primary for Governor, held a news conference in Wichita where he announced that, if elected, he will work hard to restore the failed Brownback Tax experiment. But he will do it differently. He will start by slashing budgets and then restoring the tax experiment. He also promised to veto any tax increases and sign a pledge never to raise taxes. We’d like to hear his ideas for restoring the highway plan, paying back KPERS, funding our public schools, and making higher education affordable. Kobach has lots of competition in the Republican nomination race including Governor Jeff Colyer, Insurance Commissioner Ken Selzer, and former State Senator Jim Barnett. The most prominent candidates in the Democratic Primary are State Senator Laura Kelly, House Minority Leader Jim Ward, former Wichita Mayor Carl Brewer, and former Secretary of Agriculture Josh Svaty. We look forward to hearing what all of the other candidates have to say about tax policy and state revenues. Read about Kobach’s news conference by clicking here. We must oppose any attempt to change the state constitution. Lawmakers should work together to fully fund all of our state’s priorities, including education. Eliminating judicial oversight of the education weakens us all. The position the state is in today was not created by the schools or the Courts. It was created by past Legislatures who avoided their responsibility to care for our state and the services we share as common priorities. Education is certainly one of those priorities but so are the social service safety net, public safety, good roads and highways, and health care. We should never say that Kansas can’t have both good schools and good highways, good schools and safe communities. This is not a zero sum game in which everyone is fighting everyone else for a piece of a limited pie. We can make the pie bigger. We can apply our state sales tax to online retailers (HB 2756). We can increase tobacco taxes (HB 2231, SB 376). We can modernize our tax code. In truth, there is much that can be done if we have the will. Changing the constitution is a distraction, not a solution. Urge your legislators to vote NO on constitutional amendments.